If you love reading birth stories as much as I do, you should know – it’s not as dramatic as this emergency situation – but not as straightforward as this c-section story. And, now you have two more fun stories to read – you’re welcome! 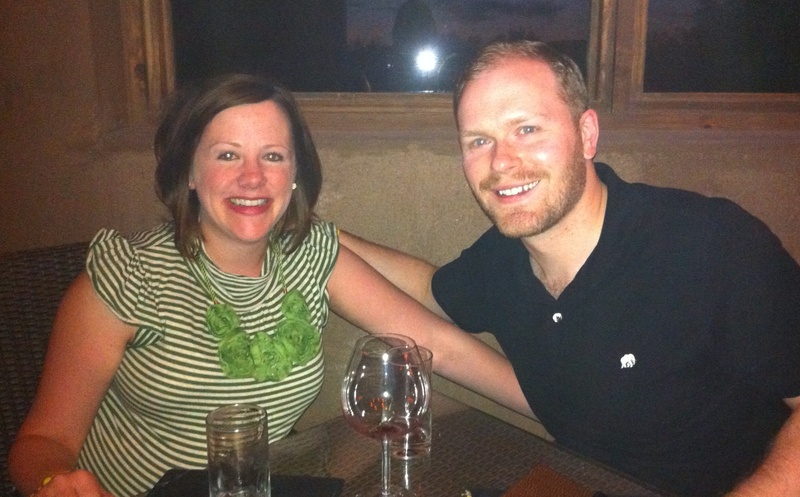 terrible photo of our last date pre-baby. It’s Memorial Day. I’ve given up on being mad-upset-disappointed-bummed that I’m still pregnant and am enjoying one last weekend – and a 3-day weekend at that! – with my man. We sleep in late, read the news on his new iPad and discuss our plans for the day: he has a tee time in a couple of hours and I’m going to finish nesting, cleaning, washing clothes. That night, we’re going to take his parents to our favorite restaurant in Scottsdale – Olive & Ivy – they’ve never been and we have a coupon. It’s going to be a great day! After breakfast (eggs and toast – little did I know what a fantastic choice that was going to be! Protein and carbs, so smart! ), I hit the shower. Before my beloved takes off for a ridiculously hot round of golf, he must take my 41 week bump shot. Because I want to look gooood in this last bump shot (induction is scheduled for Wednesday), I must have perfect hair. Also, in the back of my mind – I wanted perfect hair for those post-birth shots of Mom & baby. Since we couldn’t be quite sure when that would happen, I’d been much more rigid in my hair washing routine the last few days. I washed it in the morning so I would have to blow dry it – not at night when I would sleep with it wet and flat iron it into submission the next morning. I made sure to use all of my fancy-schmancy products, not forgetting a drop – JUST. IN. CASE. This particular morning would be no exception (SO I THOUGHT). 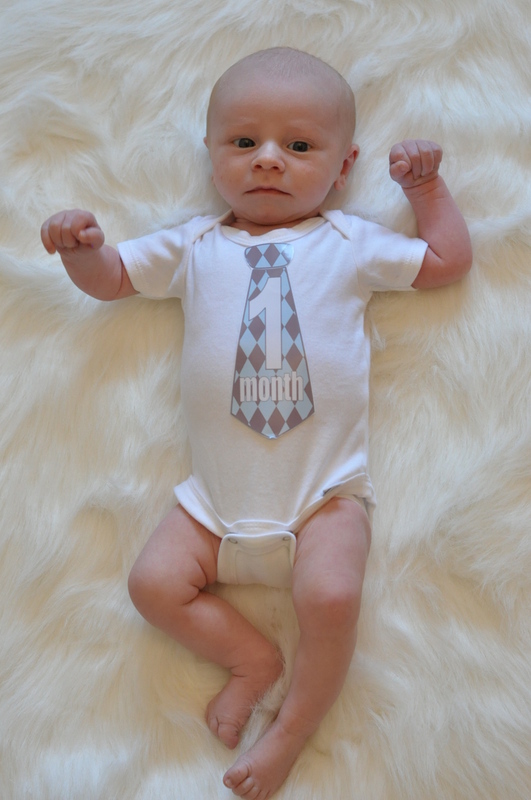 Up until this moment – 9:00 AM on May 30, 2011 – I’d had the most boring pregnancy in history. No complications – with me or the bebe. No major pregnancy symptoms to complain about. Even the fact that I was exactly one week overdue was textbook perfect. (Early on, my OB told me to tell everyone my due date was June 1st, not May 23rd. I should’ve listened.) But now… things were starting to get interesting. Instinctively, I knew my water did not look right. It was a dark yellow-brown. Water is supposed to be clear, right? Naturally, I did what any girl in my situation would do – I called my Dad. My Dad, in his cool, calm self takes the phone and I explain the mysterious color to him. In that sweet, reassuring tone I was hoping for – he explains that the water is stained with meconium, which is not uncommon for a late-term baby. He tells me to call my OB’s office and then congratulates me – reminding me that with 24 hours, we’ll have a baby. Not to mention his first grandbaby (first for both sides, in fact!). Fantastic! So, that blow-dryed hair clearly isn’t going to happen. Neither is makeup. Frightening. However, that’s the furthest thing from my mind in this moment. I grab the nearest maternity dress, throw a head band on my sopping wet head, quickly grab a few toiletries and start throwing panicky orders at my husband – who’s still trying to figure out how his perfect day off just got thrown into a tizzy so fast. By 9:30, we’re at the hospital. (It’s thankfully very close to the Dream.) We’re put in a triage room and the tests begin. Among the first things I do is casually drop my dad’s name. BINGO! All of the nurses are so excited. How is he? Your Keith’s daughter?! Yes, special treatment – exactly what I was looking for. Thanks, Dad, for being such a wonderful doctor and genuinely nice person – so glad to take advantage of that for my own benefit. Initial tests came back questionable. Baby had a dip in his/her vitals within eight minutes of being admitted… but then seemed to bounce back. So, we were sent walking – around and around the floor. Apparently, the whole water breaking scenario hadn’t clued my body into the fact it should start labor on its own. 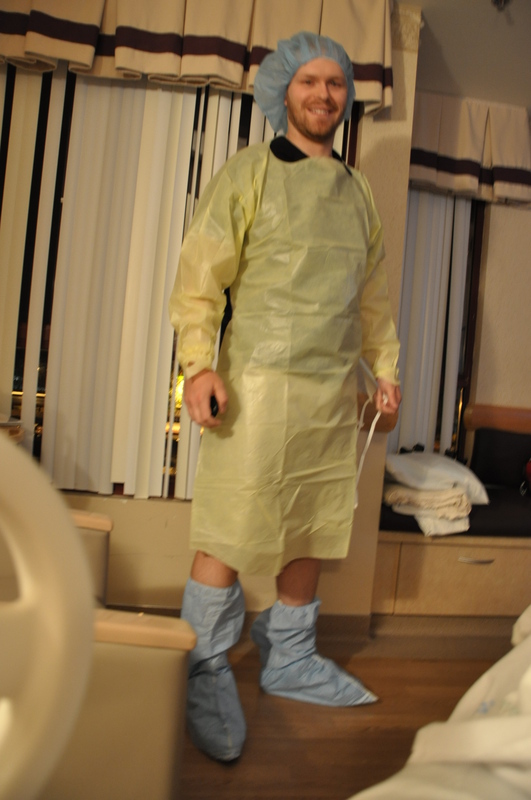 The nurses thought being vertical and on the move would help get things started. 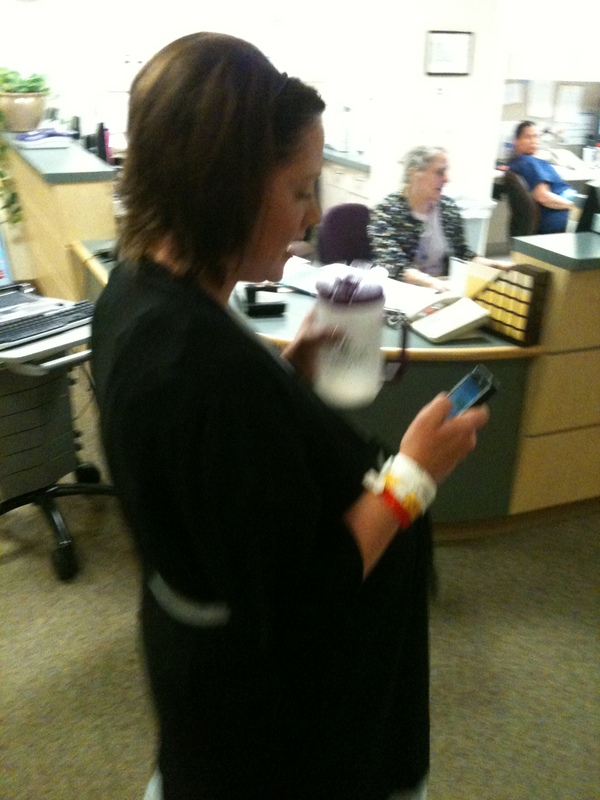 Multi-tasking momma… walking, dragging IV, drinking water, and texting. That was a fun experiment that didn’t work. 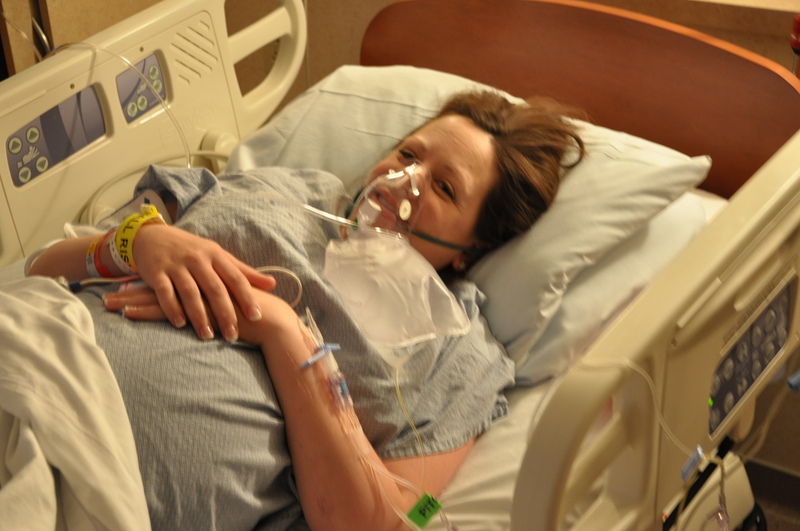 So, at 1:00 PM, we started Pitocin – the drug that gets those contractions going for you when nature doesn’t. Delayed cord clamping/cutting. We opted against banking cord blood – so I wanted that good blood to pump into our babe’s body before we cut him/her off. Start breastfeeding as soon as possible after birth. I ended up getting only one of those three wishes! The first was dashed at 5:00 PM. After four hours on Pitocin, my contractions were getting more and more intense. They were two minutes apart and lasting 45-60 seconds. No one had checked to see how dilated I was for a while – but we were all confident things were moving along well, so I threw in the towel and my new BFF, the anesthesiologist came to my rescue. Getting the epidural was NO BIG DEAL. Seriously – I don’t know what some women are talking about when they say it’s a terrible experience. It was virtually painless for me and I experienced almost immediate relief. The bummer? I was only two centimeters! Talk about feeling like a complete WHIMP! Oh well, with the epidural on board, we were able to increase my Pitocin and get this show on the road! Remember, my water broke at 9:00 AM – so I’m guaranteed a baby by 9:00 AM the next morning, now 16 hours away. This is when I started doing the math in my head. My water broke eight hours ago and I’m only 2cm. I have 16 hours to get to 10… that probably isn’t going to happen. Jason and I talked about that possibility and I told him I was sure we’d end up with a c-section. Of course, that’s not what we wanted. In fact, a c-section never even crossed my mind during pregnancy. You know those emails you get that tell you to “click here for more information on c-sections, just in case”? Yeah, I deleted those. Never read the c-section chapters in my pregnancy books and didn’t pepper my c-sectioned friends for info. The only miniscule amount of info on c-sections that I had was what we discussed in our birth class. And that was not a lot of prep for what was going to come! So, with the Pitocin dialed up and me resting comfortably, Jason and I were left alone in our L&D room for what was sure to be a loooong night. 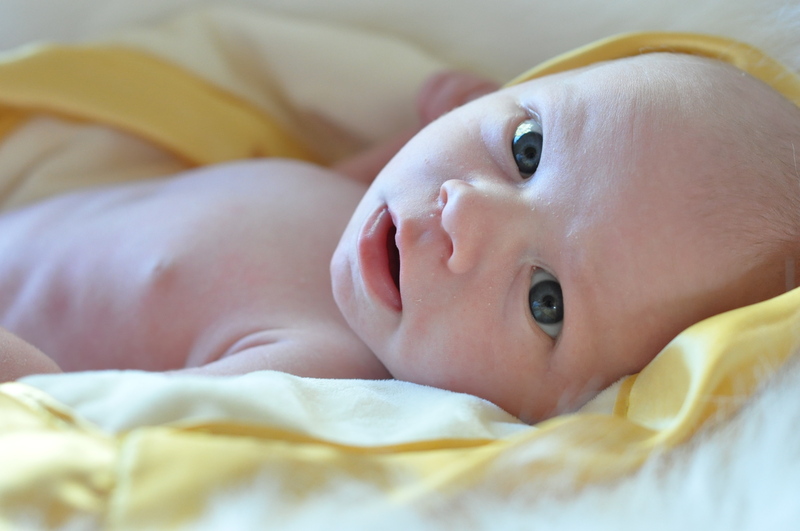 I started to doze off – lulled to sleep by the rhythm of our baby’s heartbeat pulsing through the monitors next to my bed. Before I could fall asleep – that rhythm changed dramatically… slowing way down. I opened my eyes to investigate just as the door to our room flew open, our nurse rushed in – followed by a lot of other people. First, they stared at the computer monitor and spoke in low voices, then they slapped an oxygen mask to my face and got more monitors situated to watch our baby. In the midst of this, I was very calm. From the moment we walked into this hospital – we knew we were in good hands. I had complete confidence in the team now surrounding my bed and was not worried at all. Until… I overheard a nurse say, “I just booked an O.R.” Then, the tears flowed. I had no idea anything was seriously wrong until then. My nurse saw my tears and immediately comforted me. The baby’s vitals dipped, but bounced back. We turned down the Pitocin and things were okay – no need for tears. I was between 3 and 4 cm. A couple hours later, we tried to increase the Pitocin again – with the same result. Dropped heart rate on the baby and the room suddenly fills with people in scrubs. Reduce Pitocin, baby bounces back. Then, it happened a third time. Apparently, the third time’s the charm. My OB – who has one of the lowest c-section rates at this hospital – was coming in, to do a c-section. The clock had just struck midnight on May 31st. My nurse broke the news in a tone that made me suspect she expected me to object. Instead, I pulled the oxygen mask off my face and said, “Let’s have a baby!” I was thrilled. Something was wrong with my little one and he/she was about to be rescued. Frankly, I didn’t care how the baby came out – I just wanted him/her OUT. Jason called our parents – who had just left the hospital an hour or so before, confident we were in for a long night. Now, they would have their first grandchild in less than an hour. They wheeled me into the O.R. – where the temperature was set at about 10-degrees. Seriously. That was ridiculous. I was shaking so bad – my teeth were chattering and they couldn’t get my blood pressure because I couldn’t stop my arm from moving. I was also operating on no sleep and was dipping in and out of sleepy-consciousness. It was all quite surreal. And the glorious sound I heard… screams. Loud, beautiful, angry baby screams. Then, the sound of those NICU people leaving the room. Praise you, Jesus! Jason was snapping away. I was rejoicing in the sound of the screams. Finally, I heard someone say… “They were waiting for a surprise! What is it? Someone tell them what it is? !” I’m thinking, yeah, dangit, somebody TELL ME WHAT IT IS! Jason was too preoccupied with making sure he was documenting the blessed event – he forgot to look. This mystery person kept saying, “What is it? What is it?” And NO ONE was answering! The little man continued to scream as he was scrubbed and cleaned. In fact, he only stopped when Jason went over and started talking to him. Upon hearing his dad’s voice, he stopped crying and immediately turned toward him – such an amazing moment! Yep, he should stick with medicine… and I really shouldn’t have been so worried about my hair. After this was all over, we were told that Kenton’s umbilical cord was lodged across the top of his head… in what’s called an “Occult Cord.” Our OB surmises that every time I had a big contraction – the cord was compressed, compromising Kenton’s blood and oxygen supply. 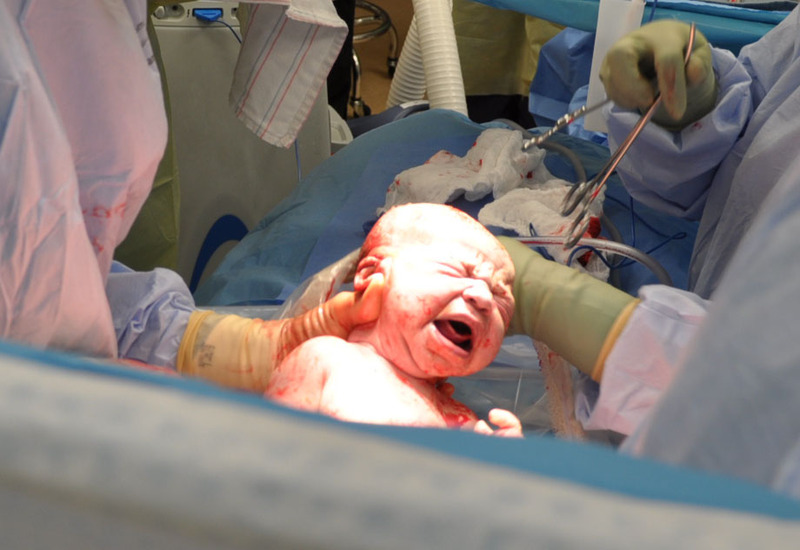 There was also a chance of developing Cord Prolapse – a life-threatening condition for mom and baby – if we had proceeded with a vaginal delivery. 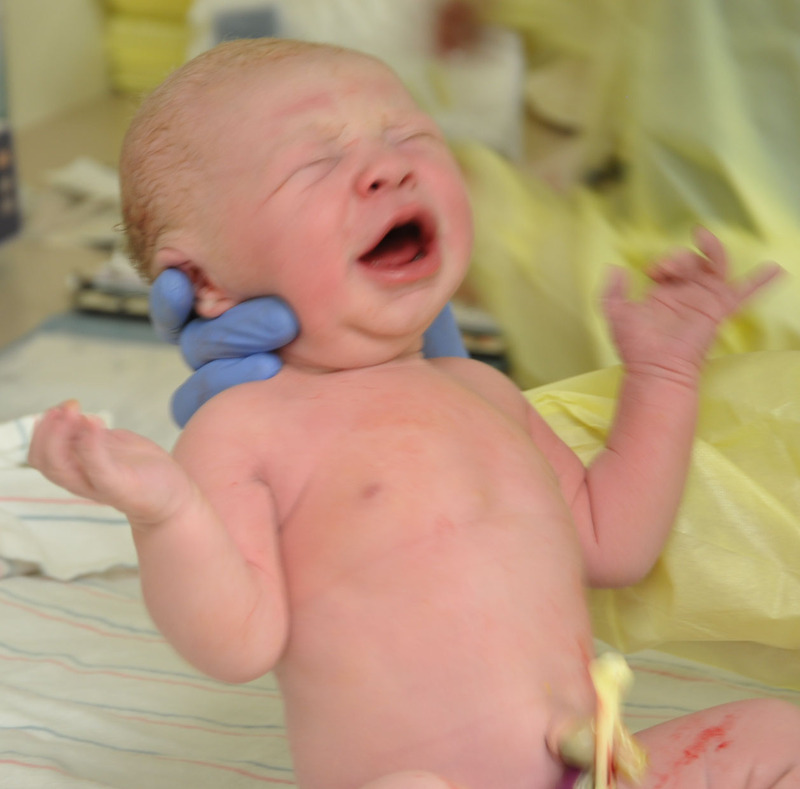 That’s why I missed out on #2 on my wish list – delayed cord cutting. Because of the emergent situation with his birth, the cord was cut sooner than we would have liked. Despite that – and needless to say – we are quite pleased with how things turned out. 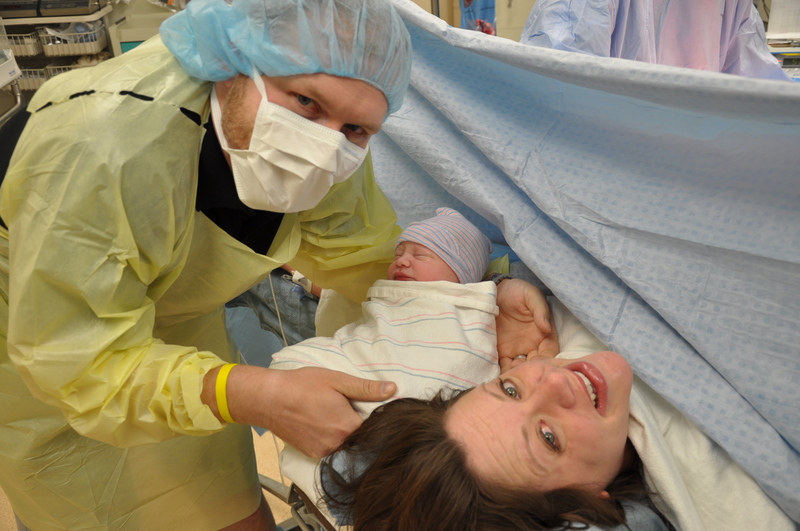 We ended up with exactly what we wanted – a healthy baby boy!